The African deserts are dry and hot. Travelers on the deserts often suffer a lot because of the heat and the dry environment. It would be lucky for a traveler if he could encounter travelers� trees on his journey, because they can not only provide shades for travelers walking under the scorching heat of the sun, but also serve them as natural water supply stations. There is a spoon-like �water storing purse� in the bottom part of each leave stalks, and each purse can store kilograms of water. When the travelers cut an opening in the purse, water will run out like a water faucet, and the clear and sweet water will wipe out the thirsty of the travelers and cheer them up. The faucet on the purse will close automatically after using; the next day it can store sufficient water and supply water to travelers again. Therefore, grateful travelers give the travelers� tree many names -�the tree of water�, �sweet water in deserts�, and �the tree of rescue� etc. Travelers� tree is a kind of vivacious herb. It is tall and upright, and looks like a tree, but it is an herb in nature. 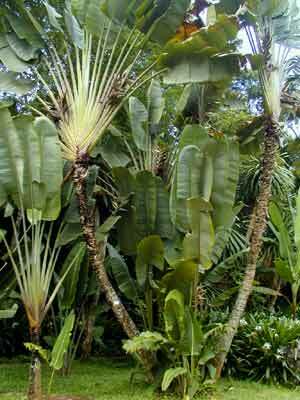 Its leaves are large and peculiar, like those of bananas. They grow evenly and symmetrically on both sides of the plant, looking like green pucker fans, or a showy peacock in its pride. The leaves display fully the charms of the tropical African deserts. The native land of the travelers� tree is Madagascar of Africa. The local folks love them so much that they elect it as the national tree of Madagascar.